A sketchbook is a place of contemplation. For some people, like me, that contemplation is of the exterior world, and focus exclusively on drawing the things that are in front of me. But for others, contemplation is internal. They draw the pictures that appear in their minds and allow their imaginations to embellish. On this week’s podcast, I talked to Mark S. Fisher, who is an illustrator, a designer, and a part-time security guard. Mark fills a half dozen books a year and has done so for over three decades. He has many interesting things to say about drawing, art, and contemplation. 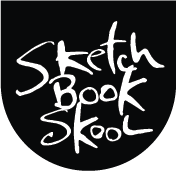 As you listen to this conversation, I suggest you check out the work on his website and two galleries of sketchbooks stuff, here and here. I found that the conversation left me wanting to be much wilder and more free in my sketchbook. I hope it does the same for you. I am very happy that Mark will be represented in my upcoming book, An Illustrated Life: drawing inspiration from the private sketchbooks of artists, illustrators and designers due out in October from HOW books ( though you can pre-order it today). The whole episode is 39 minutes long; it’s perfect to listen to as you draw in your own journal.